It was another very nice day today, and Franco and I were outside almost all day. After breakfast we headed out to the woods and made 3 bundles of fir boughs. I started the chainsaw for the first time this project. There was one fir tree that was just too big to cut with the bow saw. It was a nice tree to boot, so I got a lot of nice greens out of it. 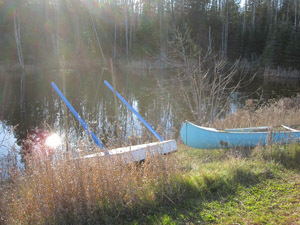 After that project, we went to work on the small dock in the front pond. This is the dock I built to make it easier to dip buckets into the pond for watering the greenhouse. 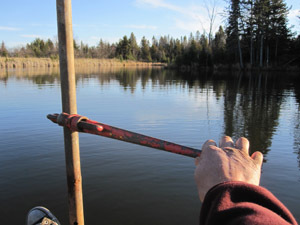 It took quite a bit of time to get the pipes augered out of the mud, pulled up and pinned in place, and then towed behind the canoe to the place where I’m storing it for the winter. I had to brace the pipes with 2x2s so they don’t break off the sleeve fittings. Once that got done, I started in on the bigger back pond dock. This picture shows me using my 24″ pipe wrench to back the augers out of the mud. I got one side mostly out and started on the other one when it became time to quit for the day. I hope the weather holds so I can get it finished tomorrow. We really enjoyed both docks this summer. My finger is healing slowly. It still hurts when I hit it, even with the thick gauze bandage I’m keeping on it. This one is going to take a while to heal I’m afraid. It is hard to type with the big hunk of gauze I have on it, but I’m slowly adapting. This entry was posted on Thursday, November 11th, 2010 at 9:28 pm and is filed under Uncategorized. You can follow any responses to this entry through the RSS 2.0 feed. You can leave a response, or trackback from your own site.